Thanks for all the kind words and comments, people. What a hectic day. But we survived, I think. Actually, I don’t know. I still have stuff to do! And guess who I met in person for the first time ever. None other than my favorite commenter of all time, Ag!! So we went in to the courthouse yesterday to get our marriage license. 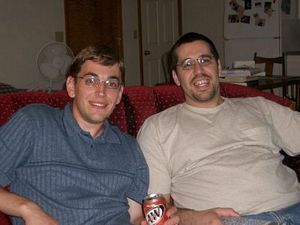 Yes, five days before the wedding. I didn’t know they interrogated you so fiercely. Lotso questions. Where was my Dad born ! How should I know! So I made an excellent guess. Confidently. I didn’t figure they needed to know that I was just making an intelligent surmisation. Ha ha! I could hardly keep a straight face. No, I wasn’t, thanks for asking. So anyway, obviously ITF has slowed the pace in recent days. And it shall continue to be so for awhile yet. I’m sorry about that, I know how upset it makes you, but that’s just the way it is. There have been a number of blogworthy occurrences lately, there just hasn’t been the time to give you the benefit of them. But ITF will be back in full swing before you know it. And just think of the overhaul and upgrades occurring at ITF headquarters. After this weekend, ITF Editor will be a married man! ITF will have gained an Executive Director! Mom and Dad flew into Hoosierville yesterday. Jewel was at work, so we went out for supper then I took them to the hospital to see her. While we were there by the nurses’ station, I asked her if she could get the finger thing. Then I made us all check our pulse and blood oxygen level. We’re all good. All is well according to the finger thing. I started to reply to a recent comment, but it turned into a post. So here it is. My whole life I’ve shunned forks and embraced spoons, much to my Mom’s chagrin. I’ve made somewhat of a name for myself in that department, hence my sister and the baritone flipping out at my mention of a fork. Forks are just so unhandy and awkward. 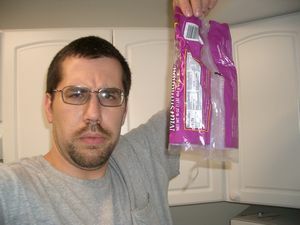 Sure, they work good for stabbing things, but most things don’t need to be stabbed. Spoons are friendly, versatile, easy to use, intuitive, and much better suited than forks for transportation of most foods. Spoons fit the mouth better, they’re much more natural. They even cut stuff better than forks. Don’t get me wrong, forks have their place, it’s just a very small one. So I’ve went on and on about how I hate the radio in at the Den of Iniquity. And I do, it’s only gotten worse since I first vented about it. I’m losing my patient tolerance, slowly but surely. Then there was this other song, “Thundercheese.” This is by hard rockers AC DC. What three words come to mind when I think of AC DC? Oh, maybe grating, vile and abominable. 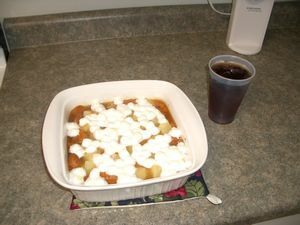 It’s long past time for another ITF culinary masterpiece! And ITF constituents everywhere start banging their silverware on the table in raging impatience! Ok, so these aren’t quite just like Mom’s. But there the closest I can come, and they’re easy to do. 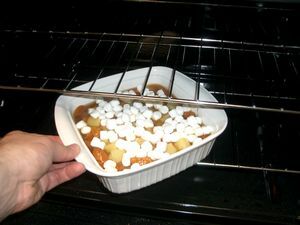 You need two 16oz cans of sweet potatoes, one 20oz can of pineapple chunks, and a bunch of marshmallows. 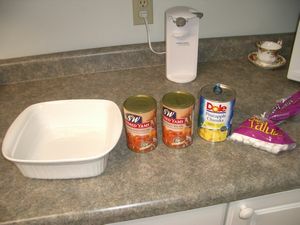 Dump the two cans of sweet potatoes (and juice) in a baking dish. These chunks were really big, so I cut them up some more. 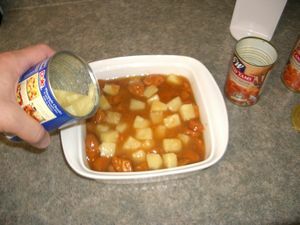 Open the can of pineapple chunks. 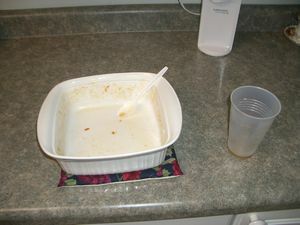 Drain (or drink) the juice, then put most of them in the dish with the sweet potatoes. Mix it up. Eat the remaining pineapple chunks with a fork. I like this dish really juicy, so I tried putting a little of the pineapple juice in. It’s a little bit much then, I wouldn’t do it next time. 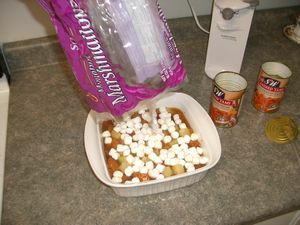 Dump in a bunch of miniature marshmallows until the top is covered. I’m quite upset, I didn’t have enough marshmallows. Don’t let this happen to you. Slide it in the oven, bake it at 350 for 10-15 minutes. Enjoy with a glass of blackberry iced tea! A few nights ago I went in to the hospital to visit Jewel while she was working night shift. One of the nurses had left this finger pulse-and-oxygen-level checker sitting on the counter, so I started playing with it. It was really cool, I told Jewel I want one for my birthday. I was seeing how much I could get my numbers to fluctuate. I spanned 9 points I think on the blood oxygen level. Normal I was at 95, I breathed and breathed and got it up to 98, if I remember right. Then I didn’t breathe and didn’t breathe and held my breath and breathed into my fist because I didn’t have a paper bag and got it to drop to 89! I was proud. Jewel was not. I forget exactly how much I got my pulse to fluctuate, but it was a little ways. It was fun. It was a wonder they didn’t take it away from me. I’m pretty disappointed in anon dude. I thought surely he’d be good for another round of laying into me, but apparently not. I’ve about got my patience stocked up again, I think I would be ready. And I had such high hopes for my “you’re the worst” anon! He’s letting me down too. Come on guys, are you only one-hit wonders? !